Nestled on the beach, this Roatan resort is within a 10-minute walk of West Bay Beach and Tabyana Beach. Gumbalimba Park is 1.3 mi (2.1 km) away. This Roatan hotel is on the beach, 0.7 mi (1.1 km) from Gumbalimba Park, and within 6 mi (10 km) of Roatan Museum and Roatan Institute for Marine Sciences. Nestled on the beach, this Roatan condo building is within a 10-minute walk of Tabyana Beach and West Bay Beach. Gumbalimba Park is 1.3 mi (2.1 km) away. Nestled on the beach, this Roatan property is within a 10-minute walk of West Bay Beach and Tabyana Beach. Gumbalimba Park is 1.3 mi (2.1 km) away. Very beautiful, well-attended and food was great I and my cousins truly had the best experience staying at this resort we will be coming back here again very soon. Where to find Roatan hotels near an airport? Where can I find hotels in Roatan that are near tourist attractions? Do your wildest fantasies involve blue lagoons, velvety sand, chipper dolphins, and a fruity drink in your hand? 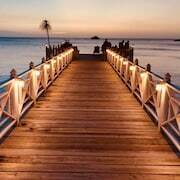 Turn your fantasies into reality on a holiday in Roatan, Honduras. The island is a prime spot for reef diving, surfing, fishing, and lounging on pure beaches. Portions of the island are covered in mysterious mangrove forests. Entertainment and shopping can be found in Coxen Hole, French Harbour, and Sandy Bay. In the distance, glassy waves twinkle above the famous Mesoamerican Barrier Reef. Roatan hotels and resorts are famous for catering to the every whim and desire of visitors. Enjoying orange sunsets and champagne toasts on an exotic island in Central America doesn’t have to be as expensive as you think. Stay right here on Expedia.ca to discover the secret to booking amazing rates at luxury hotels. We also have a few helpful travel tips to make your holiday even more relaxing and glamorous than you thought possible. Fall in love with the island’s colourful Caribbean vibe. English is the primary language spoken by natives. However, brushing up on your Spanish skills before your trip won’t hurt. Local cuisine borrows from Honduran, African, and Caribbean influences. Fresh fruit and fish are featured prominently on menus. Unspoiled beaches offer you the chance to participate in wild water sports under a strong sun. The town of West End is the centre of the island’s nightlife scene. 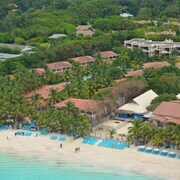 The fabulous hotels in Roatan do nothing to detract from the unspoiled beauty of the beaches and mangrove forests here. You can simply melt away into the sand until it’s time to enjoy a great dinner or pick up some souvenirs. Are you looking for a place to enjoy eternal summer? The Bay Islands of Honduras enjoy consistent hot temperatures throughout the year. Rainfall is pretty evenly distributed throughout the seasons. Expect temperatures to linger near 32 degrees Celsius from July until October. The months between November and March are considered part of the island’s cold season. However, daily temperatures during this period linger near a warm 28 degrees Celsius. 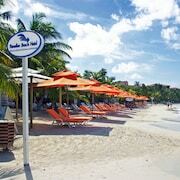 Take pleasure in knowing that hotels in Roatan have lounge chairs waiting out by the pools all year long. This is a vacation you’re going to be bragging about for a very long time. Go ahead and brag about snorkeling at Tabyana Beach, jamming along with live music at Mahogany Beach, or singing with parrots at Maya Key. Taste, see, and feel exotic trees and fruits on a tour of Carambola Botanical Gardens and Trails. Take an enchanted walk through the Blue Harbor Tropical Arboretum. Of course, you’re more than welcome to never leave the luxury and comfort of your hotel or resort. Ready for long, lazy days in the paradise? Put our amazing deals in your pocket while they last. Are you ready to put together a vacation photo album that will make all your friends green with envy? 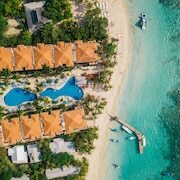 Discover why bundling Roatan flights and hotels is the best option for saving money. Our cheap deals make it possible to plan an extravagant holiday on any budget. Simply take a minute today to use our online booking tools or speak with our knowledgeable vacation planners. We have exclusive tips and specials to help you plan a perfect honeymoon, romantic getaway, or family adventure. Be savvy and partner with Expedia to stay at a top Roatan hotel or resort without breaking the bank. What are the most popular Roatan hotels? 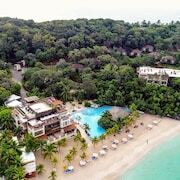 Are there hotels in other cities near Roatan? 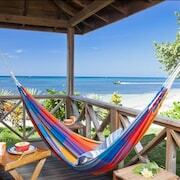 What other types of accommodations are available in Roatan? Explore Roatan with Expedia.ca’s Travel Guides to find the best flights, cars, holiday packages and more!